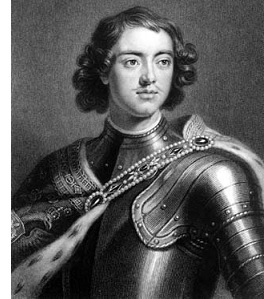 Peter the Great (1672-1725) - The Tsar who turned Russia into an empire, Peter the Great actively pursued a policy of expansion and modernization for his country. Though the youngest son of Tsar Alexis, he was practically destined to rule. His two older half-brothers both suffered from disabilities which shortened their lives. Feodor III followed Alexis, but died in 1682 at the age of only 20. At that point, Peter was declared joint ruler along with his half-brother, Ivan V. But Ivan was both physically and mentally infirm and largely a figurehead. Everyone was simply waiting for Peter to reach an age at which he was capable of leading on his own. Everyone, that is, except for his older half-sister, Sophia. She made an attempt to seize power for herself, but failed. And when Ivan died in 1696, Peter became the sole ruler of Russia and was ready to take charge. He viewed his country as a primitive and backward land and took steps to change that, chiefly through strengthening ties with Western Europe. One of his first goals was to make Russia a maritime power. That was easier said than done, however. Because for all its immense size, Russia was practically a landlocked nation (at least in the West). Its only European port at the time was the northern city (almost reaching the Arctic Circle) of Arkhangelsk (Archangel) on the White Sea (which is an inlet of the Barents Sea). The Baltic was controlled by Sweden and the Black Sea by the Ottoman Empire. In 1696 Peter captured the Ottoman fortress of Azov and converted it into a Russian naval base. But he wanted more. Turning his attention to the Baltic Sea, he declared war on Sweden and its king, Charles XII in 1700. Despite an initial setback at the Battle of Narva, Peter regrouped and took the the Swedish province of Ingria in 1702. This gave him access to the Baltic Sea where he founded the city of St. Petersburg in 1703. Now Peter had a great port city from which he could build a powerful navy. He would spend most of the rest of his reign strengthening the military. St. Petersburg is Peter the Great's most lasting legacy and he is considered perhaps Russia's greatest ruler. Besides building a navy that put his nation on par with the other great powers of Europe, he is also credited with closing the technology gap between Russia and the rest of Europe.